Athletes, reserve your spot to compete in the New Mexico Senior Olympics State Summer Games, happening this July 19-23 in Albuquerque! Space is limited and spots are flying so register now! The state games prepare these talented athletes for the National Senior Games that occurs every two years, and will be held in Albuquerque in 2019! Each of these incredible athletes has an intricate personal story to tell. Meet 10 of the outstanding athletes that will be competing in this year&apos;s State Summer Games. 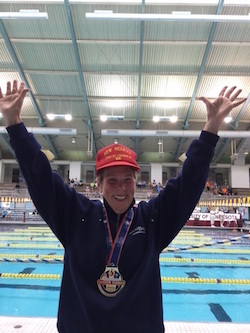 In 2015, Ann enjoyed her best year ever, winning her first Gold Medal, her first Silver Medal and two Bronze Medals in her age group in the National Senior Olympics. "I entered six events and won four medals," Ann recalls. She won the Gold Medal in the 50 yard Backstroke and the Silver in the 100 yard Backstroke. Last year, Ann recovered successfully from a hip replacement and was in physical therapy after a knee replacement, when she suffered from a burst appendix. "I&apos;m not one to run to the doctor at all, but I knew something was wrong," she remembers. She underwent emergency surgery but for a month, she was unable to participate in physical therapy for her knee. By the time she was able to return to the pool, scar tissue had developed in her knee. She was unable to bend her knee to kick off from the pool wall between laps. Rather than quit competing, she doubled down on physical training. For an entire summer, Ann went to physical therapy five days a week and often twice daily. This year, Ann&apos;s goal in the Summer State Games, is to compete but not necessarily score medals. "Winning isn&apos;t everything. Just showing up is important," said Ann. To maintain her healthy habits, Ann swims twice a week with a swim buddy and supplements swimming with water aerobics and water strength training. Her concession to "age?" She refuses to drive in the Santa Fe snow. After David semi-retired from the world of manufacturing printed circuit boards, he took up running track. In a big, big way. 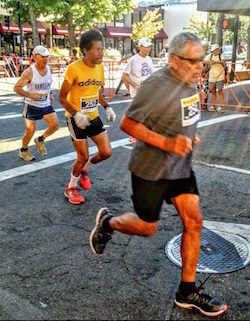 He currently has eight Gold Medals from the New Mexico Senior Olympics, including winning last year in the 5K Road Race with a time of 21.02. He also competes at the National level in the USA Track & Field Masters level. 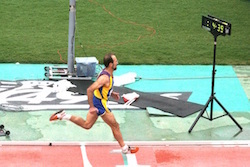 In the Masters, he holds a National Championship in the Pentathlon, which includes the 200 meter and 1500 meter races, the long jump, and the discus and javelin throws. 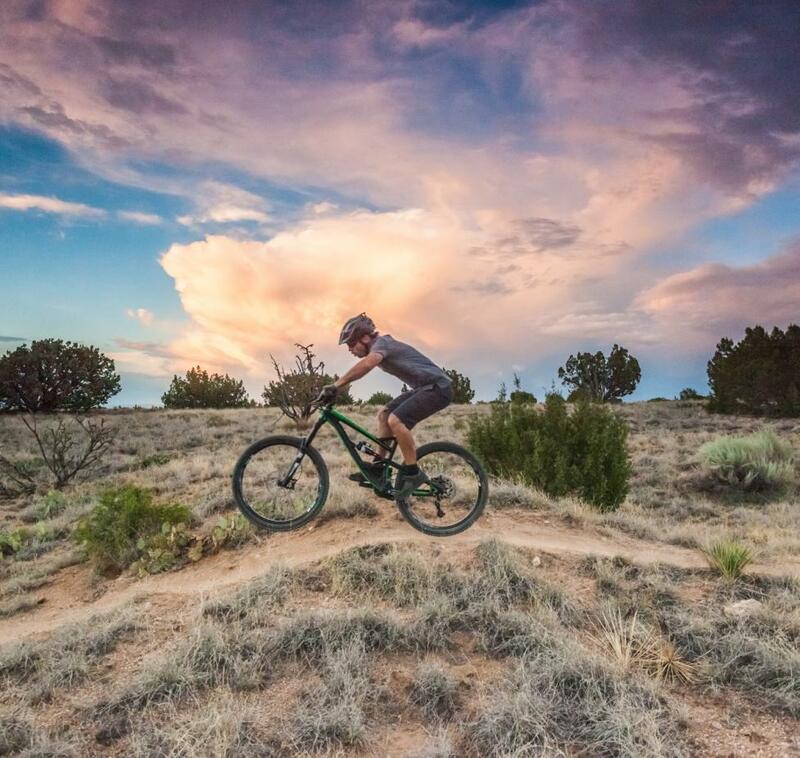 "I have always been active and stayed fit," explained the native New Mexican. David ran track in middle school but took up the sport again at age 40, specifically so he could participate in senior-level sports. In the interim, he also coached track for 12 years at the East Mountain High School in the East Mountains. "We helped establish a tradition there" in track and field and cross country, he said. In the 15 years he has participated in the New Mexico Senior Olympics he has competed in a several different sports, including discus, running long jump and the long jump, in which he won a Gold Medal with a distance of 14 feet and 5.6 inches. Part of David&apos;s strategy for success in track and field events is to remember that the sport is 100 percent personal dedication. "It&apos;s a team and teamwork. But it is up to you to perform when you are out there," he said. You hear the refrain of "if you don&apos;t use it, you lose it," from a lot of senior athletes but none demonstrates this more strongly than Colleen Burns, who is a swimmer extraordinaire in the 65-69 age category. She has been swimming competitively in the Senior Olympics and the Masters level since she was 50 and has done nothing but improve with age. She credits her extraordinarily long-lived and healthy family: Her mother Mary Kirsling ran half marathons and 10 K runs until she was in her 90s and Colleen&apos;s older sister is a Boston Marathon finisher and an endurance runner. Colleen herself, runs triathlons, 5 K road races and competes in Western equestrian events like barrel racing and ranch horse versatility. She lives on a 20-acre ranch in McIntosh, south of Moriarty, with her husband, a former Marine. Before dawn, she&apos;s out feeding the horses and animals until she heads to the University of New Mexico to swim with the Masters level swimmers. As her normal workout: two miles. She enjoys the solitary state of concentration and determination. "I was thrown into competitive swim team when I was 15," recalls Colleen. Her father wanted her to have a sport at a time when there were few outlets for girls in sport. "There was no place for girls in those days," said Colleen. In her 40s, she made up for lost time when her grown son, who was also a swimmer, inspired her to get back into training. Since then, she has competed regularly in Senior Olympics in both swimming and track taking Gold Medals in the 400 and 1500 meter runs, 5 K races and in 50 and 100 yard breaststroke events. She still trains, but is more relaxed in the way she approaches it. She doesn&apos;t have to train as hard or as often as she used to but she&apos;s cautious about leaving gaps between workouts. "As you get older you have to be diligent about the length of your breaks because it hurts like heck to get back into shape," she said. 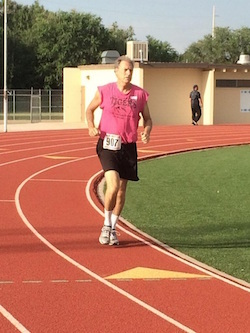 Bob has been participating in New Mexico Senior Olympics for about 12 years. Last year, he won a Gold Medal in the 400 meter with a time of 1:37.52. He maintains his fitness by jogging every morning a mile or more keeping a leisurely pace. Three times a week he works out in the gym, concentrating on strength conditioning. When he gets serious about training for competitions, he goes to the track to run speed trials. With each run, he strives to shave seconds off his time. 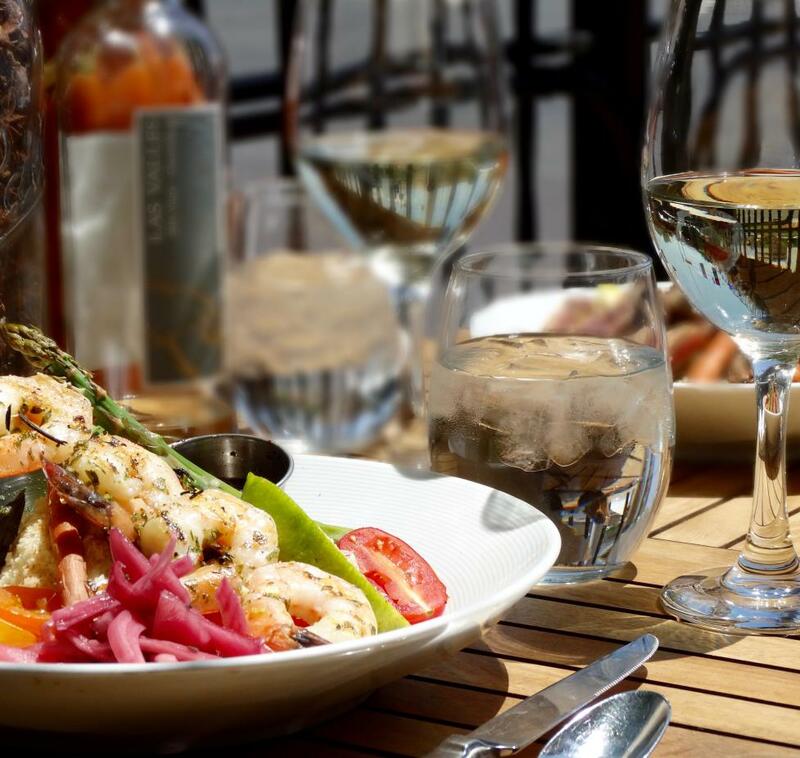 While competition is second nature, Bob also believes deeply that exercise and a healthy diet are an important facet of aging healthfully. Exercise is crucial to build balance, strength and stamina and to support healthy memory function. "I just want to keep active. It&apos;s part of my lifestyle," said Bob. Kay Dolce defies the stereotype of the little grandmother. Well, she is little. 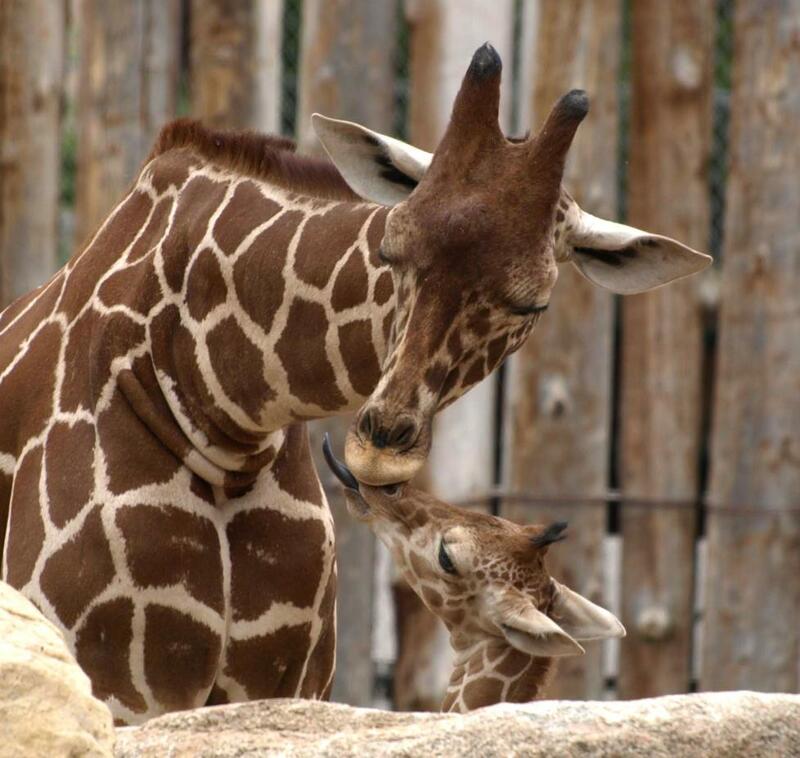 She stands just over 5 feet tall and weighs about 100 pounds. But don&apos;t let size fool you. She&apos;s earning her black belt in taekwondo, a Korean martial art that emphasizes head-height kicks, jumps and spins. And this senior athlete, who is a retired computer programmer from Sandia National Laboratories, bests many other athletes in just about any other competitive sport, including basketball, shot put, javelin and long jump. In fact she has earned two gold medal in her 20 years with New Mexico Senior Olympics: in 2014 in the standing long jump and in 2016 in the shot put. "I grew up when girls didn&apos;t do things in sports. I started playing basketball when I was 74. 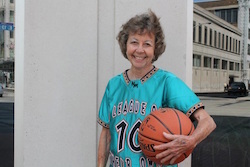 I had never even held a basketball," reminisced Kay. She was inspired learn hoops by some watching some other senior athletes compete. After they won awards she started asking questions about how they got started and where they trained. That was the beginning. 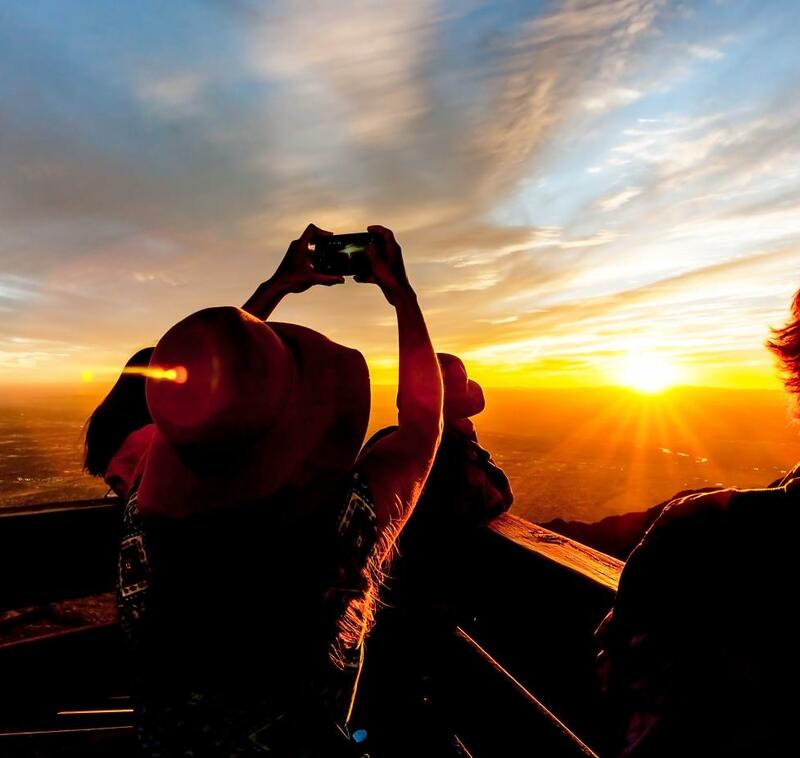 Now, she plays basketball on a senior women&apos;s&apos; team in Albuquerque, hikes every trail in the Sandia and Manzano Mountains and trains for her events. 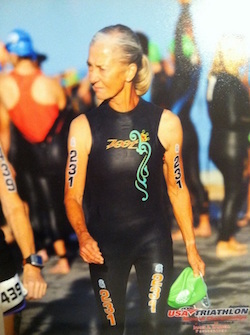 In June, she competed in the National Senior Olympics, in Birmingham, AL. The National games are held every other year and in 2019 they will be held in Albuquerque. Kay said she plans to keep competing in taekwondo and Senior Olympics as long as she can. Kay credits her Midwestern mother, who lived to 96, for her remarkable endurance and agility, especially in learning taekwondo late in life. "It&apos;s good for the body/mind connection. As I get older, my mind isn&apos;t as sharp as it used to be so it helps having to memorize all those taekwondo moves," she explained. 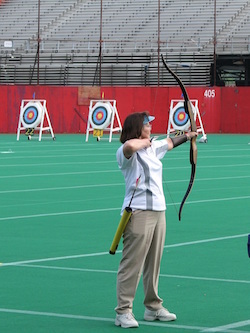 Peggy McDonald may be older than the character Katniss Everdeen, star of The Hunger Games movies, but she shares a deep love of archery. She especially loves the challenge of using an old-fashioned style of bow without sights, stabilizers or any modern technological assistance. "It&apos;s a lot of fun. But I also have limited competition in my field," Peggy explained. She is one of just a handful of New Mexican women who shares a passion for the traditional longbow archery, which because of its simplicity, is more challenging than archery that provides the shooter with some technological advantages. She holds New Mexico Senior Olympics Gold Medals in 2014 and 2016 in Barebow Recurve shooting. Archery has proved to be a great sport for the couple. 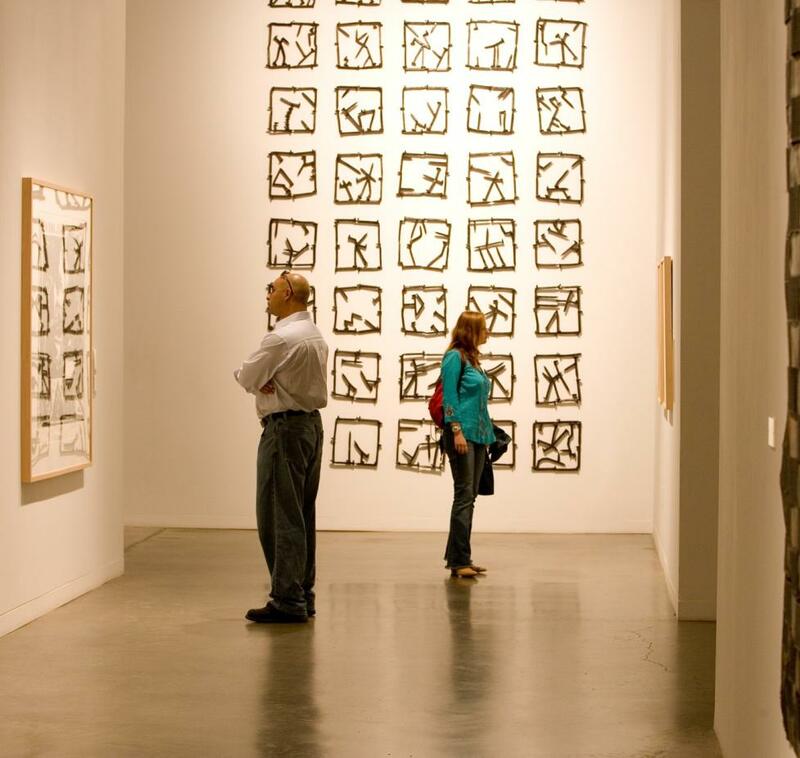 Charles makes Peggy&apos;s arrows and equipment and the couple hones their skills in Three-Dimensional competitions, in which they walk a course and shoot for points at life-size animal replicas. Points are given for distance, angle and accuracy. Charles also hunts but Peggy prefers target practice. She regularly scores between 543 to 642 points. Archery is scored on distance from the bullseye. A bullseye hit earns 10 points, while a hit at the edge earns just a one point. Gold Medal track and field medal winner Ross Aragon was a skinny kid during high school in Los Lunas. He didn&apos;t participate in any of the strength events that he excels in as an adult. "I was too little," said Ross, explaining that he started school at age five and when he graduated from high school he was still little more than five feet tall. He didn&apos;t get his proverbial growth spurt until his second year at New Mexico State University when he sprouted to six feet and gained more than 100 pounds. After transferring to the University of New Mexico, Ross began lifting weights and participating in the strength and endurance-based events he specializes in as an adult, especially the javelin throw. 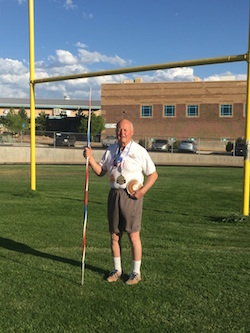 He has been competing in the New Mexico Senior Olympics since the 1990s and in 2013 won a gold medal in the javelin throw for a distance of 131 feet and 6 inches. He also holds a national record for his age group for a distance of 130 feet. In his younger days, Ross said he used to throw a javelin more than 200 feet but as a senior athlete, he is still breaking records. He works hard at not acting his age. He lifts weights three days a week; runs sprints four days a week and trains for his Olympic events once a week. The retired businessman also pitches on an Albuquerque softball team. And he plans on participating in the New Mexico Senior Olympics well into his 80s. Standing 6 feet 4 inches tall and with 47 years of organized basketball under his belt, Troy Hudson has room to boast about his skills in hoops. "No one can touch me on the free throw line," said Troy recently. He might be right. In 2016, Troy won a Silver Medal in the Free Throw during the New Mexico Senior Olympics Summer Games and a Gold Medal in the 3 Point Shot. He currently serves as the Director of Activities & Athletics for the Roswell Independent School District. Prior to accepting that, he was a basketball coach for Western New Mexico University in Truth or Consequences. Troy can&apos;t remember a time when he didn&apos;t run or play basketball. He grew up in a family of six kids in Prescott, AZ and all of his siblings and both parents played sports. He played basketball in the family driveway, in a church league and later in high school and college. These days, he stays active by lifting weights, stretching and riding his bike to work, church and shopping. He also runs track and excels in road races. In last year&apos;s Senior Olympics, he won Bronze Medals in both the 1500 meter run and in the 5 K Road Race. Staying active as a "senior" is easy for him because it is simply a continuation of a lifelong habit. Troy is living proof of the New Mexico Senior Olympics motto: "You don&apos;t stop playing because you grow old, you grow old because you stop playing." Philipp Djang is a man of many impressive accomplishments. He holds a Ph. D in engineering, works as a senior operations research analyst at White Sands Missile Range and has won dozens of awards and honors in science, engineering and military applications. But it is his achievements in sports that are the most inspiring. He holds records in Masters swimming at the international and national levels and also holds records nationally in the Senior Olympics. 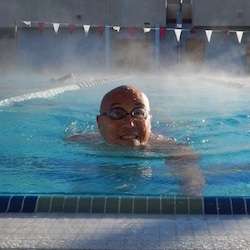 With the New Mexico Senior Olympics, Philipp&apos;s list of records number in the double-digits and includes winning events in every stroke, including freestyle, fly, back and breast. He even holds a 2011 record for a comedy skit he did for the Senior Olympics Talent Show, in which he jokingly says he "came in 5th out of three contestants." Philipp has been swimming since he was 10 years old. He competed in college swimming, focusing on swimming distances. Philipp was taught to swim by Dr. Robert "Jack" Welch, who was himself a Senior Olympian, and inspired his protégé to also compete in senior games. "He is a New Mexico Golden Athlete and has been my inspiration in many ways," said Philipp of Welch. "When I was a college swimmer, my maximum daily training distance was 22 kilometers (approximately 13 ½ miles.) So with age, I have reduced the training volume and focus more on science-based technique," explained Philipp. As a senior athlete, he strives to maximize the efficiency of each stroke. He considers swimming to be the best exercise for longevity but he also plays racquetball and participates in triathlons. He is living proof that competitive athletes don&apos;t suddenly become couch potatoes when they reach some magical age. Esther Felipe is an inspiration to her family, her Pueblo tribe and to pretty much everyone she encounters. She took up running when she was 57 years old and hasn&apos;t stopped running in 30 years. At the time, her grandson was in high school and the school was holding a fund-raising race. She entered and finished the race, winning a small pot. After that, she was hooked on exercise. For the past 21 years she has participated in the New Mexico Senior Olympics, usually competing in 11 track and field events. "I can&apos;t stand sitting around. I&apos;m an outdoor person," Esther explained recently. She travels the Southwest entering 5 and 10 K road races and half marathons, plus she belongs to several running clubs. While many people her age suffer numerous health issues, including high blood pressure and diabetes, Esther has none of those aliments. She attributes it to daily exercise and a healthy dose of competitive spirit. In addition to running, Esther plants and maintains a large garden and takes care of two orchards. In 1991, she retired from nursing and a mere two years later, she ran 42 races in a single year. Last year, she won five gold medals in the New Mexico Senior Olympics State Summer Games in the 85-89 age group, running both sprints and road races. "I&apos;m getting up in years. But I haven&apos;t given up," she said. Esther said she views exercise as an essential element of healthy aging, both physically and emotionally. Exercise builds stamina, self-esteem and confidence. Plus, the healthier you feel, the younger you look, she said, and that&apos;s important at any age. Athletes and volunteers are encouraged to register to compete in the event HERE!